We are your Trapping Supply Headquarters. Government orders welcome. We are Worldwide Leaders in Trapline Supplies and Animal Damage Control Equipment. 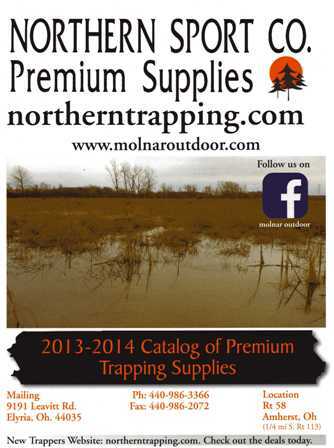 FREE SHIPPING ON OUR TRAPPING SUPPLY CATALOG. $3.00 per copy or free with order. Order our 2013/2014 supply catalog. This catalog is filled with 1,000's of products for the trapper and ADC officer. Filled with produts and information. Please check back to our website often as we will continually be adding trapline supply items to our website. PLEASE VISIT OUR MONTHLY SPECIALS SECTION IN THE CATALOG INDEX LOCATED IN THE TRAPPING SUPPLIES DEPT. FOR GREAT SAVINGS!